Welcome to Week 18 of the One Yard Wonders Sew Along! 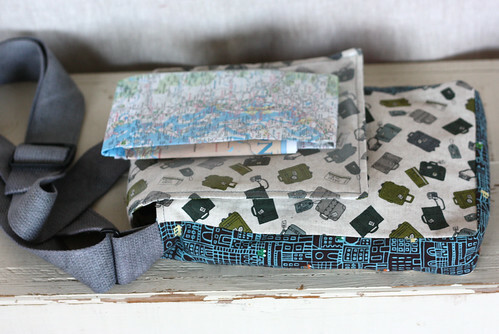 Tracy selected 3 fabrics for the Map Bag. Michael Miller Fabrics Honk Honk Brown, Michael Miller Fabrics Dumb Dot Gray, and Kokka Trefle Travel Bags Natural. 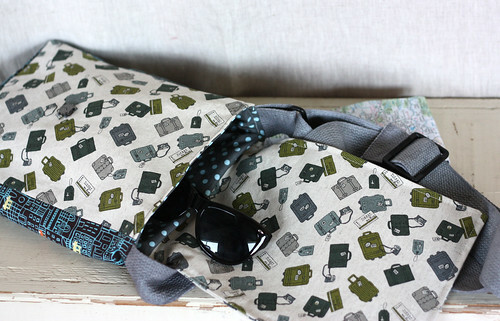 Matt’s Map Bag is a practical, simple to sew project. The instructions are well written and easy to follow. The only challenge was the bulk in the corners when sewing the bag exterior and lining together then top-stitching through all the layers. Next time Tracy will grade the seam allowance in order to trim more bulk out of those areas. A regular sewing machine foot wouldn’t sew over the vinyl, she used a teflon foot with no problem. Tracy had a hard time locating 2″ webbing in the color she wanted. She used pearl gray Rit Dye to match her bag. Using the dye gave wonderful depth to the strap. 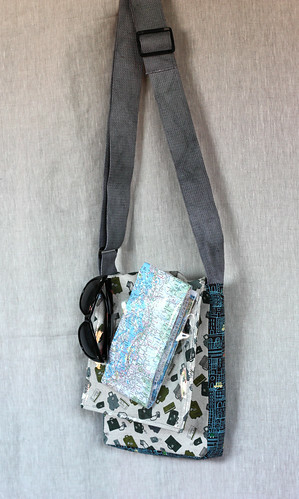 Next time she makes a Map Bag Tracy will use 1″ width strap to better fit the scale of the bag. This basic design would work in a variety of shapes and sizes; it’s very cleverly constructed. 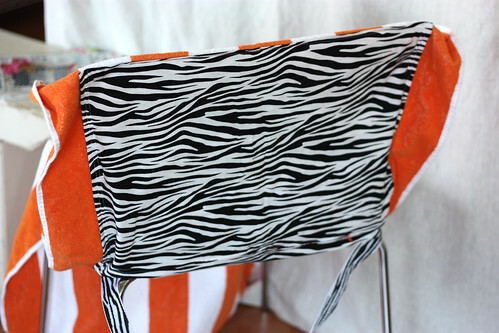 Jacqui chose Robert Kaufman Metro Living Zebra Stripe Black to go with her orange and white beach towel. 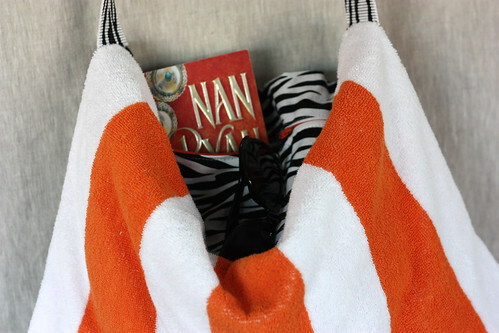 The Beach-Time Towel tote is more versatile than the picture shows. It’s a chair cover (that stays put! 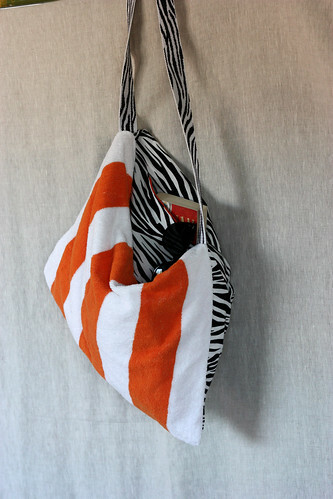 ), a tote and a portable purse. The zippered pocket is convenient for keys, camera or a bit of spending cash. Even when you use it as a chair cover, your items will not fall out. Since the towel will most likely get wet, you might want to first place your items in a plastic bag. 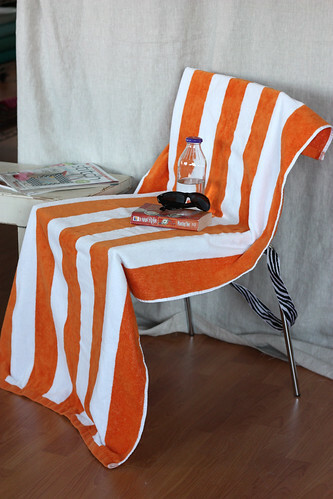 Jacqui used a lighter weight beach towel. It fits nicely within its attached tote and it was much easier to sew through. The Zebra striped webbing from Jacqui’s stash is perfect for the strap. The project is easy, quick and straightforward. Love it! It’s the perfect gift for a grad, summer birthday or just because.